Beautiful ethnic bracelet in solid silver. No punch but the metal has been tested. Inner diameter: about 5.8 cm. Ancient jewel, late 19th or early 20th century. Hand delivery possible paris 9th. 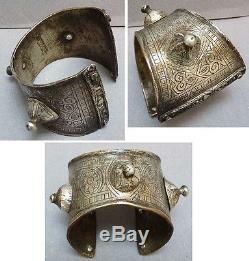 The item "antique bracelet silver massive ethnic maghreb anti-atlas morocco silver bracelet" is on sale since Wednesday, February 15, 2017.